So somewhere in my wild imagination, I had visions that this year we would be as lucky. We got Abby all dressed up after dinner on Friday night (maybe mistake #1). She wore a cute black velvet jumper with white turtleneck underneath, white tights, and black shoes. You could eat her with a spoon she was so cute. We got in line at the mall and she was in a pretty good mood. She liked looking at all of the decorations and she babbled while we were in line. We pointed out who she was getting ready to see and she would say “ho, ho, ho!” So we were feeling really positive. Until . . . It was our turn. Santa’s helper called for us and Abby had a cow. A full throw-herself-in-the-floor cow. I picked her up and carried her over to introduce her to the Big Man in Red and she calms down a little bit until I try to sit her on his lap. So I sat down with her to see if she would calm down. She did. A little. I hated Santa as a child so I guess this is payback for what I did to my mom. Adopted or not, the apple doesn’t fall far from the tree. Previous postHow will I ever choose? Christmas card time! I definitely think they had that planned out in advance! LOL! If only hubby would have hopped in! Yeah, the bench was definitely a smart call on Santa’s part! 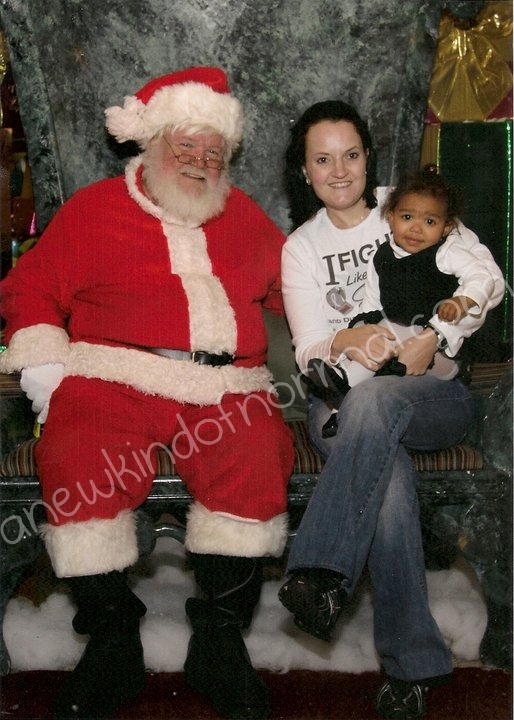 ha ha ha…all 2-year olds are terrified of Santa! It’s like a rite of passage. I just listened to a David Sedaris essay about photos with Santa, so this struck me as extra funny! The picture turned out nice.